Planning a grand event? Start with grand publicity designs. Solve your advance publicity problems in one place, with the matching Opera Event Kit. This Opera Poster, with a lush and vibrant red and white musical background, helps you get the word out with class, dignity, and charm. Upload eight unique images to the template to promote stars or sponsors. 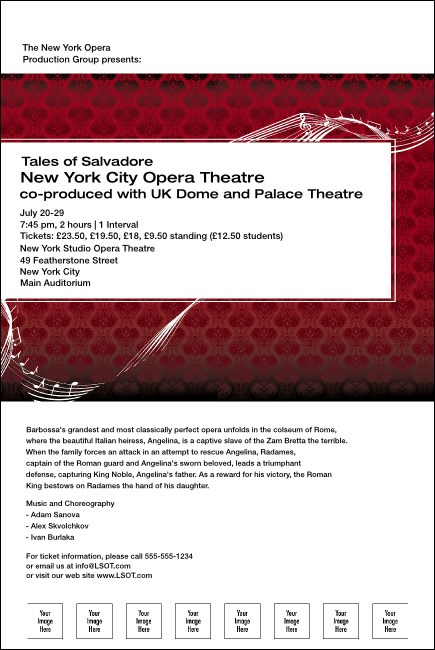 Your words and music, TicketPrinting.com's designs: a classical marriage.